There’s a sentence I never thought I would read. On Friday, Nov. 2, Dartmouth experienced what was essentially an on-campus shooting. All students were notified via DartAlert about the incident on an ostensibly normal Friday evening. Students who were getting ready to party on Webster Avenue, studying in the library, or spending a casual night in with friends all came to a halt after receiving a DartAlert notification about a shooting near campus, subsequently closing windows and blinds and turning off lights, anxiously waiting for updates on what was before a typical Friday night. And yet, despite the initial shock, activities the next day resumed for many — perhaps as soon as the shelter advisory was lifted around 1 a.m., for some students. College President Phil Hanlon’s email to the community about the details of the incident were lost in a sea of campus-wide blitzes about dance workshops, student productions and academic dinners. School shootings are nothing new. In 2018 alone, the United States has witnessed 297 mass shootings. Countless news articles and media segments barrage the public, desensitizing us to the terrifying power of the gun and its wielder. In each of the many cases, I objectively acknowledge the loss of a life, but always feel emotionally removed from such incidents. I always told myself that if something similar were to happen within close proximity to me, I’d be much more shaken. Unfortunately, that was the case for me on Friday night. In a friend’s room, we received the news, locked our door, talked about it for a bit and then continued to play FIFA. Yes, there were occasional periods of more grave conversations where we checked in with our parents to assure them that we were okay or listened in on the police scanner, but if I’m being frank, we were laughing and joking around within 10 minutes of receiving the news. If anything, some of my friends were more concerned about how long the lockdown would be because they just wanted to go home. The College administration appears to be emotionally distanced from the incident as well. While it is understandable for the live notifications from the College to lack any empathy to prevent panic, the email sent out the next day consisted of an equally dry report of the shooting details. Toward the end, President Hanlon concluded with an unexpected, cheesy one-liner, “Let us continue to be there for one another.” It sounded like an obligatory afterthought necessitated by the lack of emotion in the entire email. 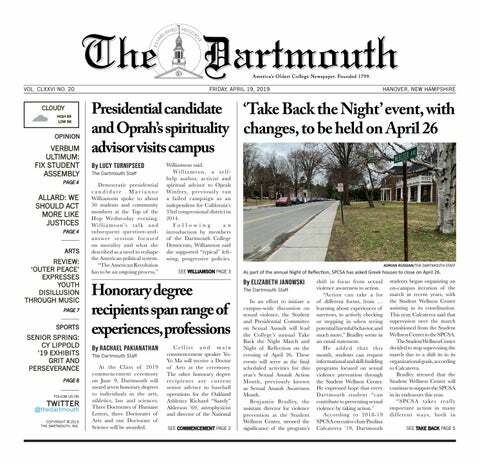 His stark dissonance in tone implied that the struggle to connect the human element to the shooting is not a unique frustration that affected me and the friends I hung out with that night, despite how personally affecting the shooting should be to the Dartmouth community. It’s something we all struggle to do, simply because we’ve grown too used to it. And that’s a bit alarming. On top of all of this, the narrative the College and news outlets deliberately followed was that the shooter was a 22-year-old with no connections to Dartmouth (which is true), and that the victim was a 19-year-old non-Dartmouth student visiting Hanover (which is also true). The gunman shot randomly, meaning it was non-targeted but such a narrative misleads Dartmouth students to believe that it could not happen to them, which is the perception that everyone already had. Given how emotionally removed many on campus are from shooting events to begin with, desensitizing the story one step further by emphasizing the non-Dartmouth identity of those involved does a disservice to the habituated younger generation. Interestingly, with the College shirking from the role of an emotional support, the responsibility fell on the shoulders of smaller social spaces — academic clubs, sports teams, religious groups, Greek organizations and individuals. Each hour, I received concerning calls from friends and a myriad of supportive GroupMe texts from extracurriculars, group projects, free food chats and even chats that I had joined at some point in the forgotten past and was no longer involved in. The genuine camaraderie amongst the students felt very much human, and that was a comfort. While student solidarity is much appreciated, more should be done to attach emotional impact to these shooting incidents. For example, law enforcement has refused to disclose the identity of the individual who was hurt because “it would be beneficial not only to the victim but to the integrity of the investigation not to release the victim’s name.” On the other hand, the media was all too eager to announce the name of Gage Young, the shooter, and Hector Correa, the driver. Instead of immortalizing the perpetrators and leaving the victim unnamed and forgotten, naming the victim and leaving the perpetrators unknown would shift the focus of the narrative from sensationalizing the event to empathizing with those who suffered. Bring back the human element to these emotionally charged events and perhaps then we’ll be able to see these shootings for the true tragedies they are.